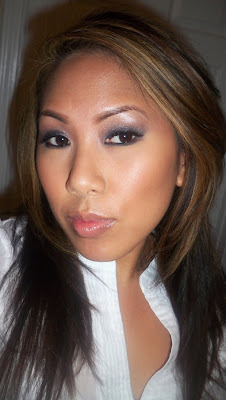 Home mineral makeup SMOKEY EYE Bare Minerals Smokey Eye Tutorial, Review & Giveaway! 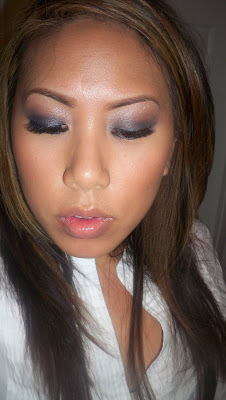 Bare Minerals Smokey Eye Tutorial, Review & Giveaway! I'm back with another tutorial and review. Today I'll be reviewing the Bare Minerals Tutorial - Lesson 1: Smoky Eye. I know many of you are familiar with this brand as one of the first huge mineral makeup companies. I used to use their mineral foundation back in the day and it was my first time trying out some of their eyeshadows. The kit came with instructions and all the materials you need for a smoky eye. Tutorials provides instructions in simple steps on how to achieve the makeup styles you've always admired but were never able to get quite right. Check out my video tutorial and review! What I thought About The Product: I love little kits like this. When I opened the box, I was surprised to see that there was only 1 brush and two mineral eyeshadows in a box that looked like it would hold more. It comes with two shadows: one is a highlight all over lid color in a shimmery champagne shade (Celestine) and the other gives you the smokey color in a lilac gray shade (Skyline). It also comes with a double ended brush...one side a pencil point for precision and the other for blending and all over color application. I find the colors to blend easily but they're not the typical charcoal/black/grey smokey shades. Instead, it's more of a blueish toned smokey eye. The instructions don't say to include a base, but you definitely need one with this. The all over shimmer color is a little dark for the bare lid color, so I'd recommend wearing a lighter base shade like MAC's soft ochre paint pot to keep the lid highlighted. Check out my pros and cons for more. -Brush is stratchy and loses shape. It was hard to fit the large brush end into my eye space. Would I recommend? I probably wouldn't recommend this for those of us with sizeable makeup applications...it's more for new makeup wearers who are building up their collection. If they redid the brush it would have gotten more brownie points. The colors are pretty and blend easily but for me, I would pass. Bare Minerals has generously sponsored a Smoky Eye Kit for one lucky reader. I think it looks great on you! I'd love to win one for myself! =) I follow your blog and sub to your youtube! i'm a follower and yt subscriber! i'd love to win because i have an event i'd love to do a smoky eye for! Hi !! I didn't really get what you meant by " which set we would like to win " but then you said that they sponsored you only the smokey eye kit ... anyways . I've been on the Bare Escentuals site and their rocker kit and smokey eye kits look pretty good . I would use my own brushes though haha . I love your tutorials because you always start off unbiased and then give your own non-harsh opinion about it . many other gurus kinda bash or give too much love to a product and your reviews are right in the middle . thank you so much !! I hope I win !! i love bare minerals. i use their matte foundation everyday. love mineral foundation. too bad the brush isn't good quality. id like to win this lilac grey smoky eye kit!! i'm just starting off and this would be a great start off kit for me to teach me how to look cute and have a finished soultry eye! i'd like to get more into makeup and try something different! thanks! :) I would like to win this kit cuz I actually don't have a gray color and I do like bare minerals it was the first mineral company I tried years ago. I also love your honesty about the brush cuz it did look cheap and crappy!!! i would love to win this lilac Grey smoky eye kit to try something different! i'm just starting off and i think this will enhance and teach me how to get that sultry cute eyes! thanks! I would love to get the celestine eyeshadow! thanks for the giveaway! I would love to win this product because I am kind of a beginner myself and i think these colors would look really good on my skin and they blend together very well. I think it would be perfect for me. Thank you for your giveaways! =] I subscribe to ou YT and I follow your blog as well! I would love to win the Smokey Eye Kit! I love smokey eyes and you made this one look great! 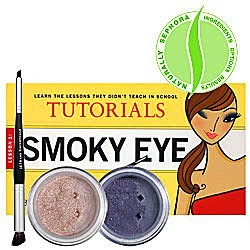 I want to win this Smokey kit set, I love smokey eyes, and I think the colors is not that dark, so it will look great on different skin tone. I also like the look on you. I'd love to win the smokey eye kit. I think I could take your advice and use my own brushes and eyeliner to complete the look. i want to win this kit coz i think the final result looks gorgeous on you and i want to try out bare minerals eye shadows too, as for the brush, i would use my own mac brushes so that is not a big deal, thanks girl, great looks! I would like to win these because i have never tried anything from Bare Minerals ! I love these shades and am building up my collection of eyeshadows. Love your blog! I would love to win Lilac grey coz purples give a pop to my brown eyes....also i really want to try bare minerals products. Thanks for the giveaway....love the look u created!! I'm really into shimmery eye shadows recently. Smokey eyes have been my fav of all time! So what is more perfect than this giveaway?! i would love to win, love your reviews ur honest and unswayed by the companies. the colors look really pretty! i sub to ur yt and blog! I Would love to win the Smokey Eye Kit. I am just starting out and do not really have any makeup. I would love to have this, to learn new tricks with and to add to me slowly growing collection. I would like to win, because I love mineral eyeshadows, and love the way the colors look :)... Amazing work.. I would like to win because I can't get enough of makeup. The look you showed is so subtle and would make a great day out look. I would like the purples but would take which ever one is available. i would like to win the Smoky eyes kit. i've been on the BE website and i discovered a lot of sets!!!!! 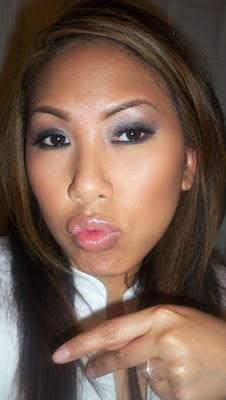 i really love the Bare Minerals Eye Club..thanks for the giveaway. Please enter me, I'd love to win the smokey eye kit because its such a soft and flattering set. I'm following your blog and also on YouTube (my screenname is arya841 on YT). I would love to win this because I have the rockstart kit and LOVE it, plus i love blueish-lilacs too! oooo i have always wanted to try the smokey eye kit, it looks wonderful on you. i love the BE sets they are so easy to use and the steps are fantasitc! I would like to win this smokey eye set because I do not own any mineral products. I love to try this out. I always want to try bareminerals too. I would love to win this e/s because I have fair skin and working with these colors would be awesome. :) you look beautiful with the colors on. i would like to win because i love mineral make up! I would like to win because I just started loving/applying makeup and so I really need to try all the different kinds to get my own feel on the types available! I would love to win this mineral smokey eye kit. I find that minerals are not harmful to my skin plus they offer great coverage, are extremely pigmented and offer versatility on many skin tones. would loveee to try your smokeeeyy eyes...great review.. I follow your bolg and o you tube. I dislike Bare Minerals brushes too. But I would love to win gray lilac and shimmering pewter. love how u do your makeup tutorials! love the Smokey eye color!!! I would love love love to win the Smokey Eye kit from Bare Minerals. Smokey eyes can really define the eye and make a woman look just beautiful! I would love to win the Smokey Eye tutorial. I'm a beginner at using make up and have always wanted to achieve the smokey eye look. Please & thank you! Smokey Eye Kit the lilac one.That is what hat I want to win. I never had any mineral make up before for eyeshadow. This seem something new I would like to try. Keep up your awesome work! i wanna win this. i wanna recreate the look you did its so pretty. I loved your tutorial. I'd like to enter to win the Bare Minerals Smokey Eye kit. Thanks. I would like to win the kit that was featured in your video. I love the lilac. I love your tutorials and love your giveaway your giveaway is very good!!! I would love to win the lilac grey one because it's so pretty and this could really help me start to expand my collection. I would love to win this kit. I am actually just getting started with makeup(at age 35 :o). BTW love your blog and videos!! Very educational. I am a new subscriber to your Yt channel and blog. I think your tutorials are really helpful and easy to follow. I have the hardest time creating a smoky eye so this kit would help me a lot. I dont care which kit,just winning would make my day. Hey Ren!!! I would love to win this kit because i need a gift for my step-mothers birthday and she LOVES Bare Minerals!!! Thank You Ren!!! Kindly enter me into the giveaway please. I am a newbie in makeup and would love to try the smokey look. More than that, such products are not available in India and it would be great if I could win. Hi RenRen, I would love to win the Smokey eye kit! I just recently started getting into make up (even though I'm 21), and would love to add it to my beginner kit. I am a follower and Subscriber. Thanks! I would like to win b/c I've never tried BE eyeshadows! I love this tutorial and all the information you provided. Ever since I saw the Kim Kardashian tutorial she uploaded to YouTube, I've been obsessed! It looks like it just started, but I can't wait for it to have all of the current Smokey Eye Tutorials.